I'd like to note, true to my OCD form I have simply alphabetized ( I used to think I had made that word up ha ha) the Beauty Boxes. This is NOT a sponsored post, this is an opinion post. I am not paid for my opinions. What the Box? $15 a month beauty box subscription service delivered straight to your door containing "5 of the most luxurious beauty products"
When the Box? There is the option to make your subscription a 12, 6, 3 or monthly subscription. Payment & Processing (shipping) is said to be done on the 15th of every month. Options to the Box? The 12 month option is worth mentioning as its total cost is $165 (1 month free) This has just been added to Bella Box, so if you're needing/ wanting to get into someones good books...this may be your chance.. Bonus? As part of an emerging trend, there is a men's subscription also available for $30 every quarter (4 months) where you will receive "6 - 8 of the best grooming products to hit the market"
Monthly subscription service only for the women's beauty box. However there is now also the option for a men's box for $19.95 quarterly (every 4 months) with 6 -8 luxury sized samples. If you refer a friend (and they subscribe) you in turn receive 200 Glossydots, leave feedback on products and you can collect up to 100 Glossydots per box. Glossydots? A reward system for not only referring a friend (who subscribes), but also leaving feedback. Collect 1,000 and you get a free GlossyBox. Availability? Glossybox in Australia took over the company formerly known as Beautybox this year, so whilst the name is new to Australia it is certainly know over the world including UK and America. Click the GlossyBox link above to go directly to their site. You are able to make an annual commitment or simply a monthly one, like Bellabox the 12 month subscription provides one month free but for $164. Subscription is not refundable but is transferable. There is also a points system where you receive 10 'love points' per month for your monthly subscription or 110 for an annual one. You can also earn points by supplying feedback for the items you have received. 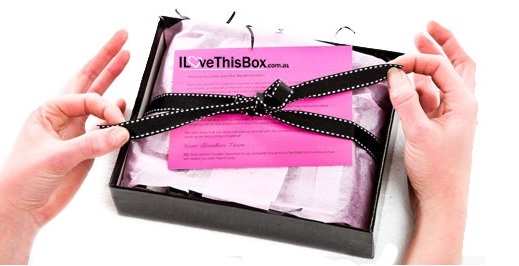 Click the ILoveThisBox link above to go directly to their site. You are able to make an annual commitment or simply a monthly one, like the above boxes the 12 month subscription provides one month free but for $160 making it the cheapest one. There is also a rewards system (seems very common) 160 reward points for 12/m subscription or 15 reward points per month for monthly subscription. Points? 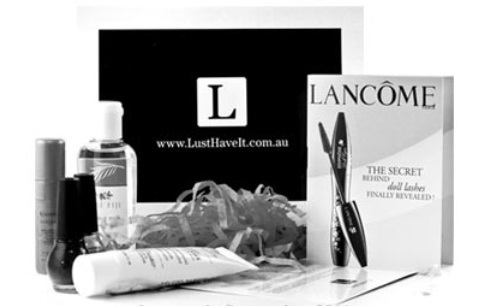 You will find with most Beauty Box websites there is an online store. This is where your points/ rewards come in handy. Save enough points and you are then able to purchase full sized products without the need to spend 'real' money. Availability? This has been viewed as Australia's version of Birch Box so the availability at current is limited to within Australia. Click the Lust Have It! link above to go directly to their site. I understand this post does not contain all the beauty boxes available (that would be quite a large post) but if there is one you would like me to review, let me know in the comments. The best decision you can make on this type of thing, is a well informed decision so I wanted to just give you the facts as best I could. I know I have been disappointed at times with what I have received or not received, but I think I will stick it out until after January 2012 and see if things have improved or snowballed. There have been great reviews on each box mentioned above, and then not so great reviews which have had some very fair points made in them, so all in all it does seem a gamble at times. Great Post! My favourite has to be Bellabox and also Beauty Basket which was just released. I like how LHI includes brands I haven't heard of (the same with Bellabox). Its always great to try something completely new out. Thank you so much :) I try and keep up with as much of it as I can, but with so much happening right now with all the beauty boxes it's quite a task. I was back and forth between countries for a while and was so frustrated at not being able to sign up for a beauty box, so I went mad when I finally settled and subbed to four of them. Going to trial them for another month or two to make up my mind and keep two but so far I think I love Bella Box. Lust have it has been pretty decent also but I was a bit dissatisfied with Ilovethisbox. I'm still waiting on my Glossybox but I couldnt help looking at spoilers. It really does cause confusion as I dont want to unsub and then miss out on a good box! Hi Jimmi, I feel your pain. It's such a gamble as to when you will get a good box and when it's a miss. It doesn't make it any easier when other people's boxes for that month are better than yours. I also take into consideration the customer service for each of the companies and which one was easier/nicer to deal with.